Our Team Building missions have expected and measurable outcomes that rely on teamwork and co-operation to achieve success. For the best team building, reward and incentive days or for corporate entertainment, our missions have a story within the game which promote camaraderie, communication and leadership. Laser Skirmish is great for both men and women and all fitness levels. 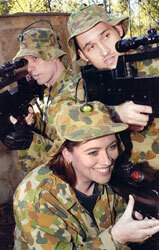 If you're a manager or executive looking to promote team bonding then Laser Skirmish is for you. Contact us now to discuss how our corporate packages can help you.